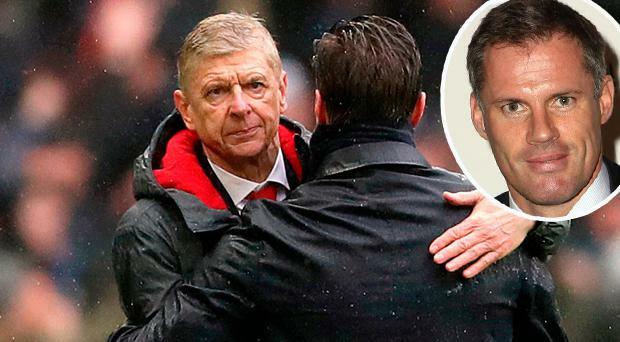 Jamie Carragher has launched a withering attack on Arsenal - describing their players as "cowards" and suggesting that a top-four finish is "virtually impossible". Speaking on Sky Sports' Monday Night Football programme, Carragher ripped into Arsene Wenger's team and described their away form, which has yielded 26 points from 26 matches, as an "embarrassment". Carragher said: "I’ve always questioned Arsenal's mentality but you've always felt they were good enough. I still question their mentality but they aren't good enough now. Arsenal are actually getting worse, they aren't getting better. "If you go back to Crystal Palace last season, I called them "cowards" and sometimes when you look back you can think it's a bit strong. But those (away form) stats back me up. "Twenty-six points from 26 away games is an embarrassment for a team that are supposedly one of the top teams in the country. "I think (top four) is virtually impossible for them. They are not catching Manchester United. It's very difficult to catch Liverpool because of the points gap. "Tottenham, who are seven points clear of them, are the best team in the league in the second half of the season and ultimately (Arsenal) aren't good enough. "They've got a points deficit and they are not as good as any of those sides. They have to prioritise the Europa League because they won't be getting the top four." Arsenal's record goalscorer Thierry Henry agreed with his fellow pundit's assessment, and said: "Realistically the competition that they can achieve the most is winning the Europa League. "I see that happening more than finishing in the top four. Something incredible might happen but it is unlikely." Arsenal's next fixture is the first leg of their Europa League last-32 tie away at Swedish side Ostersund on Thursday night. Sam Dean Unai Emery has launched an impassioned defence of Shkodran Mustafi after the Arsenal defender faced a barrage of criticism for his role in Sunday's 3-2 loss to Crystal Palace. Sam Dean If a single game could summarise the imbalances in the Arsenal squad, the unavoidable contrast between their attacking brilliance and their lingering defensive ineptitude, then this was it. Sam Wallace You tend to get what you pay for in football and in hiring Unai Emery, Arsenal have paid for the man who knows more about the Europa League than any other.